Plates4less kept everything a secret until Jackie's birthday, she was really surprised and delighted! Speedy service and first rate customer care, thanks! Love my new plate, thanks for making it so easy! Latest: "2018 in review - the numbers are in!" "2018 in review..."
Try your name, initials, vehicle, anything. This unique system generates all the private number plate searches possible, based on your input and then checks our huge database of over 40 million plates for matches. The system does all the work so that you don't have to. However, if you don't see anything you like online, you can always fill in a short enquiry form for one of our expert staff to do more searching for you! Our biggest seller, millions to choose from at reasonable prices. Click 2 or more ANY tabs to choose your letters and numbers, click SEARCH. The more tabs you fill in the more focussed your search will be. The same structure as registrations being issued on new vehicles. Click 3 or more ANY tabs to choose your letters and numbers, click SEARCH. The more tabs you fill in the more focussed your search will be. Browse or search through these desirable plates. Complete with guidance. Type into the box above and click SEARCH. The first UK “dated” number plates, great value and ideal to cover the age of a vehicle. Ideal for Rolls Royce Owners, or believers in the supernatural! This button opens the Information Centre in a new window or tab so that you can refer to it while you continue browsing the website. Do you wish to open the Information Centre in a new window? Congratulations! An exact match has been found for the registration 9406BY. Follow the link for more information concerning the registration mark. We also have listed similar plates below the exact match for your registration. Should you require any further alternatives, please click here to complete a search enquiry. The registration you are looking for 9406BY is not currently available for sale. The nearest matches to your search are shown below. Were you searching for a word? Try entering the whole word and let us work out the swaps for you. Or contact us for our expert team to help on 01792 477316 or click here to complete a search enquiry. Registration plates have changed many times over the years since the UK vehicle registration system began in 1903 and it was not until the late 50's and early 60's that the idea of having a transferrable personal registration plate on your car, was born. The first sequence of registration plates began with one letter and one number eg A1 closely followed by numbers up to 999. Then these were reversed and more letters were added up to a maximum of three letters and three numbers eg ABC 123 or 123 ABC. These cherished personal reg plates are dateless as they were not intended to have any relation to the age of the vehicle they were assigned to. There are many of these still in existence and for sale today but they are not the most popular choice of our customers as they command prices well into many thousands of pounds. Established in 1997, we have over two decades of experience, with expert teams ready to help you. More five star reviews than any other number plate agent & a customer satisfaction score of 9.9 out of 10! The less expensive alternatives can be searched using the search systems on the FIND NUMBER PLATES link above. These include DVLA Prefix number plates, DVLA Current style number plates and Northern Ireland Format registrations starting from as little as £130 including VAT and transfer fee. Whilst the Irish plates are all dateless (as they also have no age identifier in the plate sequence) they can be transferred to any age of UK registered motor vehicle, not just those registered in Northern Ireland. The only drawback with personal Irish plates may be that they always have an I or a Z in the letter combinations but you’ll find this isn’t the case for the other British plates. It’s possible to choose your initials or a three letter word of name to search and it’s even possible to get some really good matches to longer names, words and phrases. If you’re looking for a private plate for someone else, as a gift perhaps, then you might like to visit our Ideas and Suggestions pages by clicking here . These have been designed with the personal number plate novice in mind to help them understand how people choose certain letter and numbering combinations to represent names, words and phrases. Northern Ireland format registrations are commonly known as ‘Irish’ registrations prior to the separation of Northern Ireland and the Republic of Ireland. Any reference to ‘Irish’ registrations on this page relate to registration marks now known as ‘Northern Ireland format’ registrations. DVLA is the government agency responsible for all regulatory matters related to the issue and display of private number plates and car registrations in the UK. The DVLA acronym means Driver and Vehicle Licensing Agency and its head quarters are here in Swansea from where it controls all UK private registration plates. It was formerly called the DVLC standing for Driver and Vehicle Licensing Centre but this title was changed in 1990 and so is now obsolete. In Northern Ireland the government agency responsible for controlling and issuing Northern Ireland format (commonly known as Irish) registrations was the DVA, this is an acronym meaning the Driver Vehicle Agency. DVLA is a registered trade mark of the Driver & Vehicle Licensing Agency. We liaise with the agency on a daily basis but VRM Swansea Plates4less is in no way affiliated to the DVLA or DVLA Personalised Registrations. All personalised number plates mentioned in this site are British i.e. issued and controlled by the DVLA Driver and Vehicle Licensing Agency here in Swansea. They are only for display on vehicles registered in the UK and Northern Ireland. Northern Ireland format registrations are commonly known as 'Irish' registrations prior to the separation of Northern Ireland and the Republic of Ireland. Any reference to 'Irish' registrations on this page relate to registration marks now known as 'Northern Ireland format' registrations. 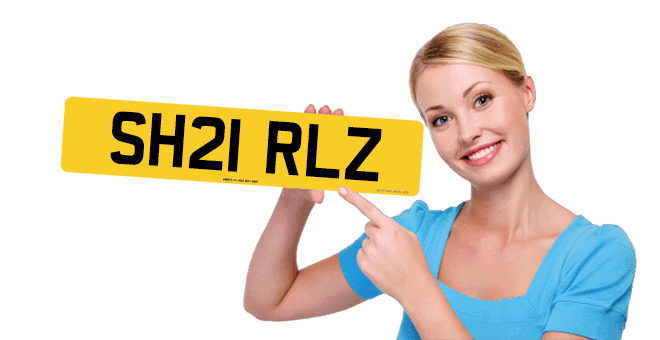 As responsible personalised number plates agents we feel it is important that our visitors and customers understand the law regarding the supply and display of cherished number plates as they are valuable assets and should be protected. It was once possible to buy cheap number plates from any private car numberplates maker without any evidence of your entitlement to the car registration numbers. These days you need to provide the private registration plates manufacturer with a V948 number plate authorisation certificate which is issued by the DVLA only after your keeper’s entitlement has been checked. Your numberplates are an important identifying feature of your vehicle and can be cloned to provide a false identity to any vehicle for those engaged in vehicle related crime. There are now many stories that tell of speeding fines collected in areas of the UK where car owners have never visited, due to the display of duplicate number plates by criminals. The law on the display of vehicle registration numbers is now very strict and personal number plates owners may not use decorative or fancy fonts. Letters and numbers must be of the correct size, style and spacing with private registration plates also conforming to strict British Standards in their materials and manufacture. To break the law on the manufacture and display means you risk having your entitlement to your cherished registration plates permanently withdrawn and face a substantial fine of up to £1000. Incorrectly displayed private plates or personalised reg marks will be enough to make your vehicle fail its MOT test.